Slot machines are found in every corner of the world, and are found in many formats. From the Pokies of Australia, to the Fruit Machines of the UK – the original game these are based on was created in the late 1800’s in the US by one Charles Fey. This page goes through the different phases of slots history, starting with the early mechanical games. I have not stopped with the present day, instead going on to cover the future direction of slots and casino gaming in general. Only time will tell if I am on the right track. Prototypes of slot games were first created with playing cards on the reels. The idea was to line up a winning combination of cards across the 5 reels, which would win a prize based on the strength of the hand hit. These could be seen as prototypes for early video poker machines in some ways. They never really took off. Instead a similar but distinct invention would gain traction over on the West Coast, the slot machines developed by a German immigrant called Charles Fey. The machine developed by Fey did not use playing cards, instead starting off with 6 symbols, including lucky horse-shoes. This worked on the principle of ‘stops’ or notches behind the symbols. The mechanical devices would stop randomly in one of the notches, and so the probability of hitting any single combination could be adjusted by having more or less notches behind it. The original game cost a nickel, with a top payout (for 3 bells) or 50c. It was the turn of the century before the concept of slots started to gain significant traction. These were soon being produced on a production line basis, with 5 different variations being shipped all over the country. It was difficult to keep up with demand for the games. This was an era when conservative values prevailed and prohibition was very much on the political agenda. In 1909, laws stopped cash prizes being awarded via slots, and in fact most forms of gambling were blanket banned at a State level. The games continued, giving out prizes which included fruit flavoured chewing gum instead of money (at least openly). It is believed that this is where the fruit symbols such as cherries which are found on slot games originated. Despite many attempts to crack down on them, slot games had become so popular that they were being mass produced by the 1930’s – moving to cheaper wooden cabinets instead of the original heavy cast iron ones. Vegas became the first place to regulate and license slot games in the 1930’s – and to this day the largest parts of every casino are dedicated to these games. There is a fascinating sub history, where devices were created to cheat and manipulate the early slot games. The casino owners and the cheats were in a perpetual arms race, with devices such as the ‘Monkey Paw’ being used to empty the slots. Many mechanical fixes (one way chutes for the coins and so on) stopped the cheats. Though it was the mid 1960’s and the introduction of electronic slots which finally saw the casinos winning this arms race. These games did not rely on the old ‘stops’, instead having the (still mechanical) reels controlled by microchips. Mechanical games tried to get bigger and better, increasing the number of reels and so the ability to offer bigger prizes. These went up to 8 reels with ‘Big Bertha’, a game which needed a small motorbike engine to run. Early video slots, where the reels were computer generated would follow 10 years later. There was some mistrust of these at first, and it was the early 1980’s before they became accepted in casinos. In a flashback to the very first ‘card slot’ games, it was the popularity of Video Poker games which got people used to fully electronic slot games. In 1986, the first progressive slot game linked between different casinos was launched. This still runs today and is called ‘MegaBucks’ and was created by IGT. This was linked between the different Vegas Casinos, and featured a $1,000,000 prize pool for just $3 per spin. This captured the imagination of the public, and this game still holds the record for the biggest Jackpot ever won, a staggering $39 million. When the jackpot drops these days, it restarts at $10,000,000. Slots got a lot more creative over the next couple of decades, with 5 reel video slots taking over from the traditional 3 reel games. The computerized nature of these games allowed for bonus and feature rounds to be added, including side-games which take you completely out of the game on the reels. The first online casino games were created by MicroGaming in the mid-1990’s. By the 2000’s these had become mainstream, and the development has just kept on improving. 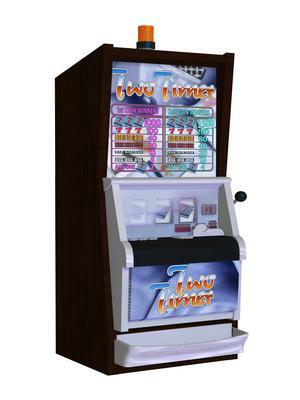 The first online slots were renderings of the traditional 3 reel games. Compared with the amazing 3D games with big movie tie-ins and crazy feature or bonus rounds, those originals are very slow moving indeed. Current slots are covered in a lot of depth here at High Tech Gambling, I recommend you start with our main online slots guide page if you are new to the genre. Mobile slots are the focus of the latest development. I wonder if Charles Fey could have imagined how far his creation would have come. Slots work really well in landscape view on your phone, and are perfect for a quick spin when you have a few minutes to kill. Another major addition over the years online is huge progressive jackpots. You can take your pick of slot games with $1,000,000+ prizes right now. The biggest jackpots won online have been close to $20,000,000 – enough to change anyone’s life. Slots are already becoming more social in live casinos, with multi-player games including shared bonus rounds (many with giant screens spanning 5 seats). There are also games with chairs attached to the cabinets which move at the right time for the storyline and have built in surround-sound capability. You will also find slots where you can save your progress through different bonus features. I think that ‘Virtual Reality’ is the next step for these games. In 2018, your slots session may well involve futuristic headsets and fully immersive storylines. One thing is for certain, slots will be with us for many years to come – and one day we will look at the latest games and think of them as antiques!